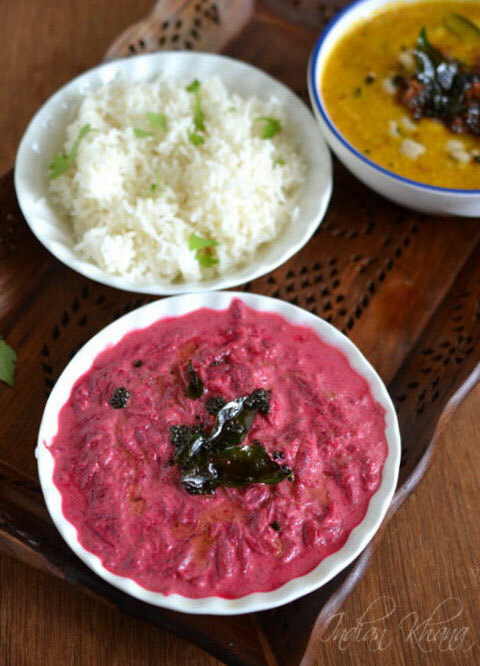 The count down is almost going to finish for Onam and today I am presenting one of the important dish of Onam Sadya - Pachadi and beetroot pachadi (raita) is famous pachadi made during Onam perhaps to make the Sadya looks colorful I guess and if you making Onam Sadya then you should not miss beetroot pachadi as it's colorful and healthy. Beetroot is one of my favorite vegetable I suddenly develop this deep love for this wonderful veggie and if you don't like beetroot then you should try it, beetroot also known as beets and one of the healthy vegetable. If you follow my blog you would know how much I like beets as I have posted Beetroot Thoran, Beetroot Sprouts Stirfry, Beetroot Masala, Beetroot Rice, Beetroot Dal, Beetroot Soup, Beets Cabbage Cutlet, Beets Cabbage Soup, Beetroot Pesto Pasta, Beetroot Braided Bread, Beetroot Carrot Juice, Beetroot Halwa, that's some list right? 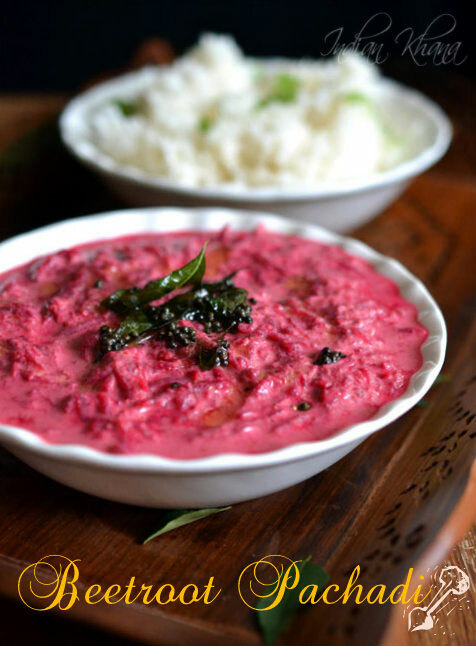 I wanted to post beetroot raita for very long time but it was not happening perhaps it was not the time until now, this raita or pachadi is Kerala style with coconut and it's really tasty, quite different from usual raita recipe and I am sure you will love it too. You can check other Raita Recipes here and check Onam Sadya Recipes collection post too. 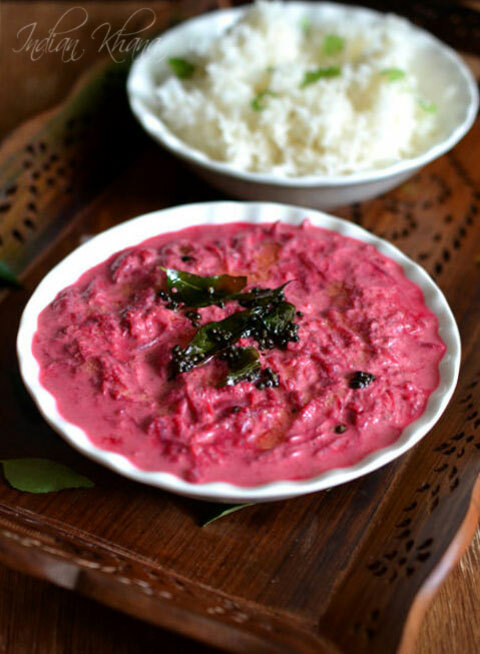 Beetroot Pachadi or Raita is Kerala style pachadi recipe made with beets, yogurt and coconut. Peel, wash and grate beetroot. In a pan or wok add water, beetroot, salt and cook until beets gets cooked for around 10 minutes in medium flame. While beetroot getting cooked, grind all the ingredients listed under 'To Grind'. 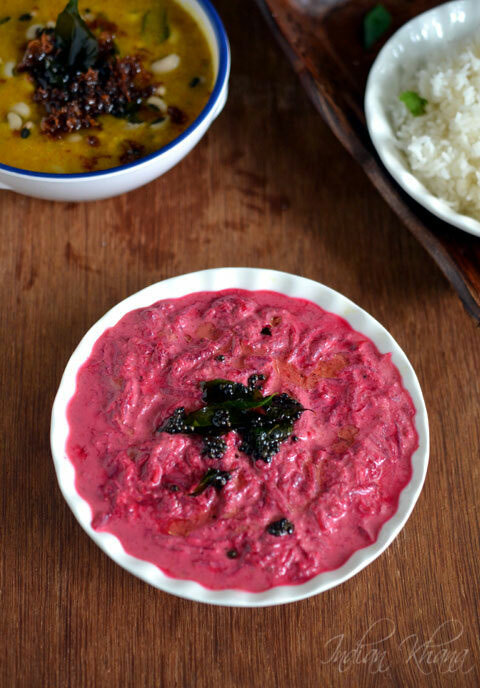 Add ground coconut mixture with beetroot mix well and keep flame in slow and cook for 2-3 minutes or until water fully evaporates, off flame and allow to cool completely. 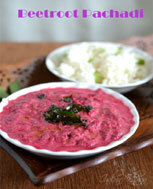 Beat curd well and mix with cooked beetroot. Prepare tempering in a tadka pan or small pan heat oil add mustard seeds and allow to splutter, add curry leaves saute for 30 seconds, off flame and pour over pachadi. Serve with steamed rice or add along sambar, rasam. 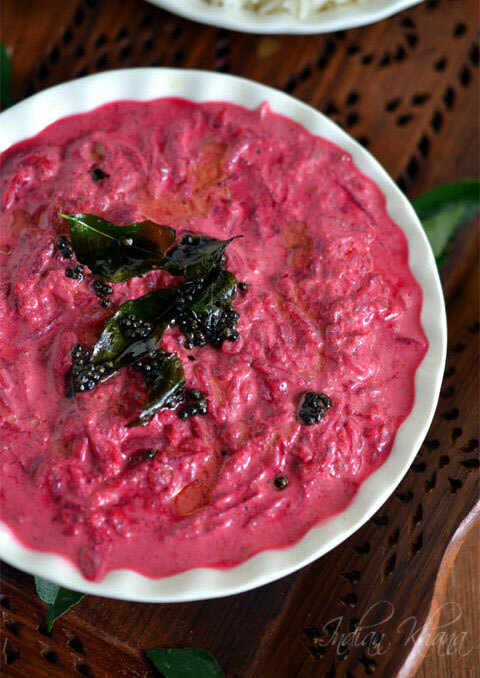 Relish the delicious pachadi/raita with a difference.